Too Many Ghosts Spoil the Broth? I was one of the lucky people who spent the 5th and 6th of this month at QED, Manchester. Apart from a minor fit of apoplexy trying to decode Manchester’s city centre roads to enter the car park and later being soaked by a bus (I'm serious - I looked like one of those car wash mops) I loved the whole weekend. It’s been interesting to read people’s online musings on the event. I think we all agree we’d like them to organise it again next year. But there’s another strand. How many ghosts are too many? There have been apologies all-round which is a great credit to the manners and mutual respect of the relevant parties. It seemed to me that the ghost complaints reflected an enthusiasm for other areas of scepticism rather than just a judgement upon us supernatural-obsessed types. But it’s a fair point and one that does deserve a reply. Why do we continue to expend so much time and energy on the supernatural when the area has been so well studied and debunked? Some skeptics like ghost debunking; some like alt-med debuking; some prefer creationism debunking. I suspect that these differences arise from individual personality traits, quirks and preferences. And that’s OK. Those of us who rationally channel our inner-Goth would appreciate a few really high points in a weekend of other sceptical subjects. But it also strikes me that as much as ghosts and other supernatural phenomena have been debunked, so have many alt-med practices and it doesn’t stop people spending money on them. Alt-med is a hydra, and its endurance is probably due to the fact that it satisfies people in a certain way. They get something for their money, otherwise they wouldn’t spend it. Buying a feeling is still a commercial transaction. In fact, I wonder whether current alt-med thrives due to the personality traits of the middle-classes: self-assertion – a certain Protestant self-reliance and independence; a mistrust of authority as being ‘better’ than oneself; a desire for devolvement of power to the patients themselves. These are personality traits which would have gotten you a clip ‘round the ear in a medieval village, but job promotion in a modern commercial environment. Unfortuately, advanced technology and theory takes the cooperation and resources of many. The results are suitably potent. But that may be unsatisfying to the modern human need to remain, even a little, in control of your own fate. The fact is, you can’t cure cancer by yourself any more than you can get to the moon by yourself. In this case, our human personality and social traits are worth studying because they apply across the board. Studies of alt-med must eventually come to analyses of why many so people in a modern context keep returning to it. It’s been useful process for mainstream medicine too, which is now practiced in a far more sensitive, more participatory and less patriarchal way than before. Do you remember when Blackadder went to the quack? Because he went in the sixteenth century, he was prescribed leeches. The famous Dr. Hoffmann of Stuttgart was the foremost expert of the age (and also, co-incidentally, the largest producer of leeches in Europe). 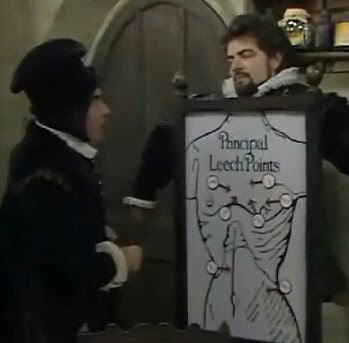 Blackadder could have been prescribed magnet therapy in the eighteenth century and ‘The Water Cure’ in the nineteenth. Charles Darwin was an unfortunate recipient of The Waters and the cure sounds considerably more grim than having a few little live blood bags dangling from your nethers. The nature of quackery changes and several fads have truly been discredited. And as I said, I think the enormous popularity of alt-med may be significantly due to social context, several elements of which are ephemeral. But religion and the supernatural are slightly different. We’re hardwired for them. Good quality study of the supernatural must endure because, when every other fad has passed, it is the one thing to which we, as a species, always return. It has been said that the difference between ghosties and ghoulies is that it doesn’t hurt when you get a kick in the ghosties. In general, we skeptics are united by the desire to perceive our world in the most rational way possible – even though we’re meat-puppets and our impartiality probably has its limits. But as a species, we do have a preference … and that is to believe in the supernatural. So we’ll always need the tools to discuss this one intelligently and persuasively. Help one of the next generation of ghost-hunters! - that is to say, a student of the human mind who wonders why we believe in such things. It takes just a few minutes to complete a survey for Goldsmiths student Aaron Shalan who would is studying factors associated with paranormal belief. Those of you fascinated at the attempted removal of David Allen Green's trousers at the airport last week may want to know about uninvited strangers rifling through my underwear. Just before Christmas, I returned from the US. I had a skull in my hand-luggage and the airport security guard swabbed it for narcotics and/or explosives. The lovely security lady's smile barely flickered when I explained that it was Mr J's Christmas present. The whole thing was done in my prescence and I was glad they were taking their responsibilities seriously. Basically, it said that my luggage had been rifled in my absence. And what's more, if they had broken the locks to do this, that was my problem. Anyone else find that really creepy? I really don't mind them looking at luggage. They should! But since I was waiting in departures for two hours, you'd think they'd have had a few minutes to get me to the Rifling Room to help. I'd be highly aggrieved to be prosecuted for carrying anything when I'd no proof it hadn't been placed there by a third party. And I'd be really pissed off to buy a new case every time I made a trip because someone had trashed the locks to inspect my toothpaste. We all know that governments use paranoid times to enact the powers they'd like to have anyway. But this one is really, I'll use the word again, creepy. I don't mind who rifles through my underwear. But I'd prefer if they had the manners to wait 'til I'm there. Today, I'm thinking about exorcising. Not running on the spot – that’s a good thing. I’m talking about dislodging demons. For the self-sufficient there is the one-day course approach. Very reasonably priced at fifty-nine pounds, this was offered recently by Atlantis Bookshop in London. Their ‘leading expert’ David Goddard has been ‘an authorized exorcist for over 20 years’. In touch with the spirit world or the spirit cabinet – I really don’t know. I didn’t go. But I was relieved to discover that the syllabus included how to distinguish between possession and mental ill-health. Absolutely vital that. This autonomous approach would probably suit the kind of people who crochet their own bedspreads, change their own engine oil and so forth. On the other hand, if you’re keen on authority, you know, the sort of person who calls in an electrician to change a plug fuse, you can go with a recognised establishment, with training courses and titles, such as the Catholic Church. In November 2010 Bishop Thomas J. Paprocki of Springfield, Illinois organised a two-day conference on exorcism attended by 56 bishops and 66 priests. The New York Times noted that there is a lot of cynicism surrounding the issue of exorcism in the US today and wrote that “efforts to interview the (delegates) on Friday were unsuccessful”. Not quite as shy, is Father Gary Thomas, the Catholic exorcist for the Diocese of San Jose, who has been interviewed for this month’s ‘Catholic World Report’. His previous exposure in the media has included being the subject of Matt Baglio’s book (& now a movie) ‘The Rite: The Making of a Modern Exorcist’. The piece is entitled ‘Doorways for Demons’ and carries a photo of Father Thomas bearing a lightly constipated grin. He tells us that there were about half a million exorcisms in Italy. Per year, that would be an impressive feat not to mention a significant aspersion upon the moral fibre of a nation of around sixty million souls. Perhaps he means the aggregate of rituals for which the Vatican has records. But personally in five years, he claims to have met with 100 people and performed 40 exorcisms on about five of them. Perhaps it's like waxing - perhaps you have to keep going back. In the study of witchcraft and demon-related beliefs, there’s a great deal of energy put into discussing whether such belief systems are, to use the lingo, ‘bottom-up’ or ‘top-down’. Are the authorities forced to deal with what are actually rank and file experiences, or do they precipitate or interpret such experiences further down the social ladder from themselves by their expectation of them. I think most historians believe that there’s evidence of both. Just for the moment, let’s think about witch trials in England, say. Prior to the eighteenth century belief in witchcraft was probably pretty endemic, but really got out of hand when traditional social structures started to crumble in the Tudor era. Witches were often deeply impoverished people who had asked for charity but had been refused. If the refuser subsequently had some misfortune, they blamed the alleged witch. Let’s face it, the refuser did sort of deserve it. It’s quite a clear case of projected guilt. Then local constable or magistrate would get involved. Bottom up. It’s an oft-repeated pattern. But you can perceive sinister hints in witch-hunting history about top-down phenomena too. A couple of the most celebrated English witch trials had highly educated men at their centre and it’s even questionable whether the trials would have stood, without the educated input and manic focus of these people. In 1589, ten year old Elizabeth Throckmorton, who had recently moved to Warboys, accused her new neighbour Agnes Samuels of being a witch. Elizabeth appears to have been epileptic and quite ill. But her afflictions, characterised by massive fits, sneezing and channeling demons, were soon communicated to four of her sisters and eventually, several of their extended household. Elizabeth’s Uncle was Henry Pickering. He was an educated man from a prominent family. And at this early stage in his witch-hunting career he conducted systematic experiments with his niece to demonstrate real demonic possession. He also took Elizabeth to live with him for a spell, made copious notes and eventually gave evidence at the trial of Agnes Samuels, her daughter and her husband. In the case of the Lancashire Witches of 1612, Justice of the Peace for Pendle, Roger Nowell, interviewed a young woman named Alison Devize who’d been accused of bewitching a peddlar. Roger Nowell was a Puritan whose professional remit included seeking out religious nonconformists (recusant Catholics, basically). Alizon talked about her black dog – her family seems to have been fond of animals and this was unfortunately a characteristic attributed to witches. Somehow, in the telling of the story, the black dog became her familiar. Alizon may even have been trying to displace the blame from herself to the dog for the peddlar’s illness which was probably a stroke. Another of the witches, an old woman known locally as Chattox, told Nowell of a ‘thing like a Christian man’ who had asked for her soul many years ago. In the religious turbulence of her lifetime (bear in mind she was probably in her 70s by 1612) - he could even have been a religious proselytiser of either Puritan or Catholic stamp. But Nowell interpreted him as the devil himself to whom Chattox had sold her soul. Via Nowell’s questioning, the Lancashire Witches’ accounts conformed to the scholarly beliefs contained in such books as the Malleus Malificarum, William Perkins ‘Discourse of the Damned Art of Witchcraft’ and King James’ ‘Demonology’. The interviewees inadvertently confirmed a highly evolved metaphysical schema that Roger Nowell knew in detail and which they likely didn’t. Agnes Samuel, her husband John and their daughter Agnes were hanged in 1593. 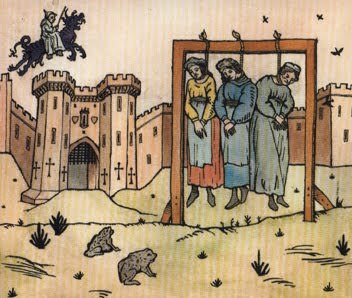 Ten of the Lancashire witches including Alizon Devize and Old Chattox were hanged in 1612. Those deaths were caused by, as much any other factor, highly earnest and highly educated men labouring under a gross misapprehension. Does that ring a bell given how we started? In 1602 there was an exchange between Lord Chief Justice Anderson and a Dr Jorden who was defending Elizabeth Jackson against charges of having bewitched Mary Glover. The Lord Chief Justice seemed unsatisfied that Jorden thought Glover’s condition neither fabricated nor amenable to medical intervention. “Then in my conscience” he said “It is not natural”. It’s nice that modern exorcists like freelance demonologer David Goddard and Father Gary Thomas take account of the possibility of mental illness before they get the paraphernalia out. Father Gary has a psychologist, a psychiatrist and a medical doctor on his team. But, despite Lord Chief Justice Anderson’s protestations, just because we can’t cure it yet, it doesn’t mean it’s not natural. And if you were suffering from an as-yet undiagnosed condition which led to mental distress, do you think a man confirming your belief in the dreadful powers of Satan and all his little fiery minions would make your anxiety worse or better? History clearly shows us that highly educated and sometimes well-intentioned people can precipitate the most dreadful of consequences. Be nice if it wasn’t still relevant, wouldn’t it? ... belief in the supernatural: what and why. Where does it lead us? She also occasionally suffers from mission creep. Jourdemayne was burned at Smithfield in London for witchcraft in 1441. Friend to the eminent and educated of her time, she was sought by many for her knowledge of dark matters. I am Editor-in-Chief of The Skeptic Magazine after Professor Chris French stepped down to take a well-earned break. I'm co-convenor of Skeptics Westminster. Visit the site to see the latest listings for skeptic events related to law, policy and the media. Join here to stay updated. Contents © Jourdemayne. All rights reserved. Please contact me if you want to reprint or reuse any of the ideas published here. "Everyone's favourite skeptical witch, Jourdemayne, with superbly written thoughts on superstition, religion and the human condition"
"My two favourite bloggers (er, after Crispian, of course) are Petra Boynton and Jourdemayne ... Jourdemayne (whose blog is not as well known as it should be) draws her insights from a different background: profound historical knowledge of the extraordinary things people have believed in. She then uses this to contextualise more contemporary matters." "... the erudite and charming Jourdemayne ..."
"This is brilliant - must read"
By Crispian Jago and Neil Davies. See all your favourites here.